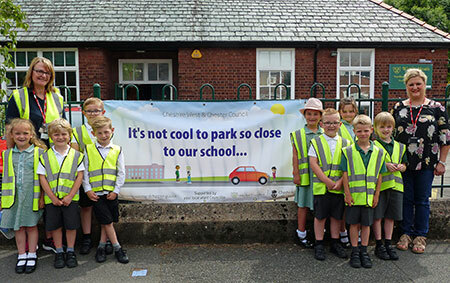 Pupils at Whitby Heath Primary School in Ellesmere Port have launched a Parent Parking Charter to help alleviate parking problems outside the school gates. The children have worked with the Council’s Road Safety Team, Locality Officers, local Police Community Support Officers and parents to develop the charter, which will challenge the way people travel to school and alleviate problems caused by inappropriate parking. The road safety initiative sees parents, drivers and school visitors make a pledge to reduce congestion and conflict outside school as well as raising awareness of parking safely on surrounding local roads. The Council’s Cabinet Member for Environment, Councillor Karen Shore said: “Pupils and staff working with both Council and Police officers have looked at the issues outside school and have come up with rules and regulations to help alleviate the problems of parking at both entrances to the school.